“PLATO’S CAVE IS NOTHING TO DO WITH ME!” | BUDDHA IN THE MUD by Tony Barrs. There are two truths: the real and the seemingly real. Their connection is the negative emotions. On the path of the seemingly real, the emotions imprison us. On the path of the real, the emotions liberate us. There is a secret life to the emotions. and that we mistake appearance for reality. Plato’s shadow images are not merely philosophical speculation about the past: they describe what is actually happening in our minds right now. We believe everything we encounter is real. We believe everything in our minds is real. We believe an external God is real, when the only reality we actually knowis our own pure awareness. Why were we turned away from our true reality? It is a shock to realise that we have been believing in images, when logic tells us that it is our own consciousness that is the only reality. We are free of images in the moment of seeing. Plato and Buddha knew this 2500 years ago, and still we do not see. Why? Because we create our own mental fantasies, and also consent to allow others to create images for us to believe in. nor let anyone else make an image for you. But we do because we believe in the images on the wall. Logic tells us these images are not real, but still we react to them. 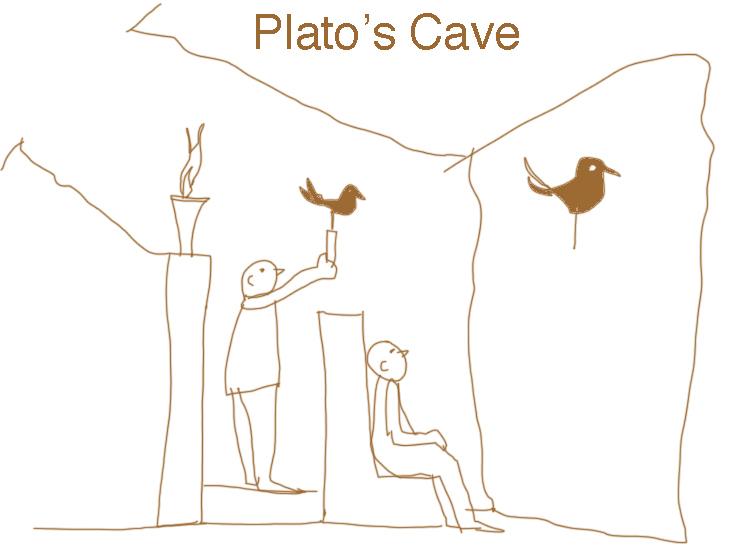 Plato likened people to prisoners chained in a cave, unable to turn their heads. All they can see is the wall of the cave. Behind them burns a fire, and between the fire and the prisoners, there is a parapet along which puppeteers can walk. The puppeteers, who are behind the prisoners, hold up puppets that cast shadows on the wall of the cave. The prisoners are unable to see these puppets – the real objects – that pass behind them. What the prisoners see and hear are shadows and echoes cast by objects that they do not see. Such prisoners would mistake appearance for reality. This entry was posted in Uncategorized and tagged Plato and Buddha., Plato's cave. Bookmark the permalink.